Joan Barbot originated from Poitiers (France) and settled in San Sebastian in his youth. He became a playing card manufacturer and his workshop was recorded in 1761 as one of four existing in the city. Barbot died in 1810 and his widow, Dña María Miloy (la naipera), continued running the business until it burnt down in 1813. A similar pack is listed in the British Museum and described as: The ace of coins has the arms of Spain displayed on an eagle with the name J. Barbot below. 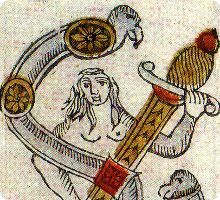 The maker's monogram appears on the 2 of swords and the ace of clubs. On the 2 of coins are the shields of Aragon and Castile. The large coin in the 5 of coins has the head of a king. [Department of Prints & Drawings, Registration number: 1896,0501.857]. 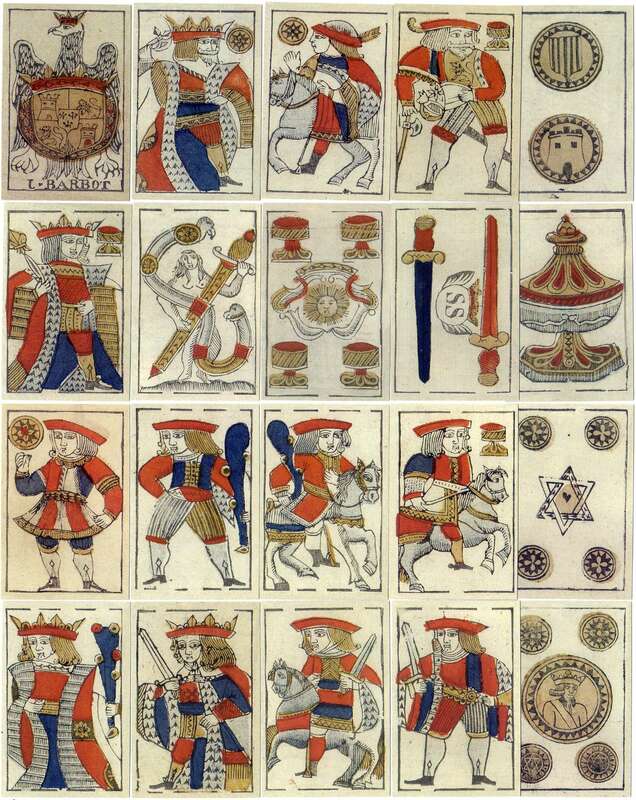 Above: cards from a facsimile edition published by Naipes Heraclio Fournier S.A. of an original pack held in the Fournier Playing Card Museum, Alava (Vitoria-Gasteiz), Spain, in 1997 on the occasion of the Asescoin AGM held in San Sebastian that same year. The publication was sponsored by Fundación Cruzcampo in celebration of the leisure and comaraderie which card playing has always been associated with.